Saber rattling hits critical mass when at least one side actually wants a war. The Gulf of Tonkin, “weapons of mass destruction,” and now “enveloping fire.” How North Korea’s threat to target missiles at an area of the Pacific ocean 20 miles from Guam became U.S.’ latest pretext for a “preemptive” war. When North Korea responded to U.S. President Donald Trump’s recent threats by “seriously considering a strategy to strike Guam,” the war sharks in Washington smelled blood in the water. The next day, headlines across both the mainstream media and some independent media outlets stated that North Korea’s threat had become a reality and that Pyongyang would complete strike plans on Guam by mid-August, less than a week away. The urgency was greatly emphasized, as was North Korea’s plan to engulf Guam in an “enveloping fire.” However, upon reading the entire statement issued by North Korea – on which these media reports were based – it is evident that this “news” is an outright lie, one intended to justify a U.S. “preemptive” strike on North Korea in proximity to China’s border. What was Pyongyang’s reasoning for preparing such a plan? Its statement directly cites Trump’s threatening rhetoric, particularly his now infamous “fire and fury” comment, as proving that “sound dialogue is not possible with such a guy bereft of reason.” The judgment made by North Korea was thus that a show of “absolute force can work on [Trump]” in defusing the situation and ending U.S. threats to North Korea. It is also worth bearing in mind that Pyongyang’s announcement came after the UN approved a new round of sanctions against North Korea over its nuclear and missile development programs. The sanctions will drastically impact the North Korean economy, the GDP of which is half that of the U.S. state of Vermont. Sanctions are often perceived as a prelude to war or U.S. invasion – as they were in Libya, for example – though some maintain that the levying of sanctions is an act of war in and of itself. This is particularly true in the case of North Korea, which has repeatedly offered to eliminate its nuclear activities and missile development programs if the U.S. would cease conducting war games with South Korea in close proximity to North Korean borders. Despite China’s repeated proposals of such a deal as a viable diplomatic solution, two U.S. presidential administrations – Barack Obama’s and now Trump’s – have rejected it every time. Given the U.S.’ refusal to negotiate – along with the drastic sanctions, the threatening rhetoric and U.S. hints of a “preventative war” against North Korea – is it so hard to believe that the country’s leadership feels desperate enough to carry out a show of force? Given the media’s response and recent statements made by the U.S. government, the evidence is clear that Washington wants you to believe that North Korea is in no way reasonable and that the threat it poses to U.S. national security is grave. So grave is the threat, we are told, that it necessitates putting the lives of millions of South Koreans and Japanese at risk. They, along with the unfortunate Guamanians, sadly seem to amount to little more than pawns in this whole charade. As of Wednesday, the Pentagon announced that it had completed a plan to carry out a “preemptive strike” against North Korea, with the Air Force stating in typically gung-ho, warmongering fashion that they are “ready to fight tonight.” The most hawkish senators in the United States, John McCain and Lindsey Graham, have supported Trump’s militaristic stance, stating that war with North Korea would be “bad” but manageable – at least for the United States. However, analyses of how an actual war would play out predict complete devastation and potentially millions of lives lost. Even Secretary of Defense James Mattis warned that any military confrontation with North Korea would mean “probably the worst kind of fighting in most people’s lifetime.” Not only that, but North Korea borders both China and Russia, so any war against that nation is sure to send refugees pouring across its northern border. There has also been speculation that China and Russia could easily become entangled in a military conflict between North Korea and the United States. The North Korean threat is being overblown and words are being twisted, as the Washington establishment – with Trump at the helm – threatens to bring about another needless war. Indeed, it is no coincidence that the “threat” of North Korea is being hyped right now. Many economists are sounding the alarm bells, while other respected analysts have been warning for months that the coming debt ceiling fight and subsequent budget battle in Congress could be enough to crash an already jittery economy. When faced with economic catastrophe, the U.S. has historically responded by starting a war. Not only that, but Trump’s other problems, such as shrinking poll numbers and the collusion investigation, would also likely be set aside were the commander in chief to become embroiled along with his nation in a major military conflict. If this “preventative war” takes place, it will be one intended to save the Trump presidency, not the American people. 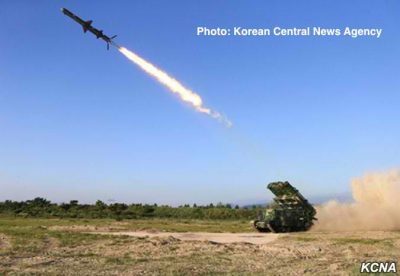 Featured image is from Korean Central News Agency via Zoom in Korea.